Many people maintain bird feeders for song birds. Therefore they are often dismayed when larger bully birds try to take over the feeder. 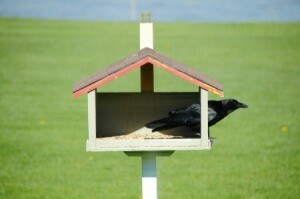 This is a guide about keeping blackbirds out of bird feeders. How do I keep of black birds out of my bird feeders? The short answer is, you don't. When I was younger I used to get mad at the "cow" birds for coming to my big feeder and eating, until one day I realized who the heck do I think I am if these birds were the color of parrots I would be relishing in having them here. The fact is we shouldn't discriminate against birds anymore then people. We would never offer food to people in need based only on looks and personality. Hungry is hungry. Read up on your pesty friends and learn about their quirks. Soon you will be as interested in them as you are the rest.